As the smell of turkey gravy permeates the brisk November air, we are reminded to take a step back and reflect on all the wondrous joys we have been blessed with in our lives. This year at Judge, we have many things to be thankful for. Here is a small selection of things the Judge team is thankful for this year. ... helping both clients & candidates meet their needs. Clients need good employees. Employees are looking for that right company. We work to bring them together to create the perfect match. ... the opportunity to work with great people who care about their coworkers, the community and the customers and candidates we interact with on a daily basis. ... working with seasoned professionals that share a common goal, to make Judge the best run company by utilizing hard work, ethics, and technology; and employees who care. ... for all that I have, because of the amazing people that have taken a chance on our company, and for those that have devoted their careers to making it great. I am thankful to have and work with such wonderful friends and family, who share similar goals, aspirations and live our core values. ... for coworkers that have become great friends. ... for the contractors with whom I interact on the phone/email. Their kind words of appreciation make my day. I am also thankful that I can always count on a colleague from the Accounting Team to cheer up my day. ... working in an entrepreneurial environment and Judge has been just that to me over the last 16 years. I enjoying building and managing a business, building relationships with clients and candidates, and making a difference in a candidate’s career. A group of people in Judge that have become an extension of my family and are lifelong relationships. The phase meetings and phase trips that have had a big impact, allowing us to get to know one another more and in the end, help us work together as a better team. ... for the endless collection of tenured individuals at my fingertips acting as constant mentors, offering up their experience and knowledge to make sure I continue to elevate my skills and become successful. ... for hilarious coworkers that make me laugh out loud every day! I am thankful for awesome resources that make my clients so happy. I am thankful for the opportunity to work with different industries and learn more about those industries and the way they do business. I am thankful for the opportunity to truly feel like a partner and not just a vendor because that is the way Judge Learning does business. ... working at a company that encourages teamwork, socialization, and the exploration of career interests. I am thankful to be given the opportunity to work for Judge as a Consultant Liaison because it involves me helping our consultants grow professionally and personally, which is very rewarding and fulfilling. ... for the world class resources that are provided to me from an organization that is dedicated towards both client and employee satisfaction. Because of that investment in resources, I am always able to deliver value to my clients. ... for my team and my management for creating a positive work environment, as well as motivating me to be successful here at The Judge Group, and in life! ... for my amazing, entertaining, and creative coworkers here in Judge Learning Solutions (JLS). JLS is composed of funny and entertaining sales professionals that make the days in the office a little more enjoyable. We have an exceptional, creative Custom Learning Team that I have learned a lot from in regards to the learning and development industry. Furthermore, I am thankful that I am able to explore countless opportunities for Instructional Designers, eLearning Developers, and Change Management Consultants and help these professionals land new and exciting opportunities. Most of all, I am thankful that Judge has given me the opportunity to learn about an industry I never thought I would be a part of. ... my director giving me opportunity to work in world class enterprise environment and for believing in me for my work. It’s because of his motivation & inspiration, that I have been formally recognized for my work. Unfortunately, I’m in the India office, so can’t join Thanksgiving Dinner party but heartiest wishes to everyone out there. ... working with such an amazing group of people here at Judge. From my NJ office, and the iterations I have seen of it over the last 10+ years, to our corporate team and colleagues around the country…. it is just a solid group of people. Happy Thanksgiving! ... for a job that I love where I can pick up the phone and change somebody’s life for the better. I am also incredibly thankful that I do not wake up dreading going to work every day. ... having a work environment that is fun and challenging, where no day is the same, and working alongside hard-working people! ... my new job at Judge. All the desserts, including Grandma's homemade apple pie!!! HAPPY THANKSGIVING ALL. 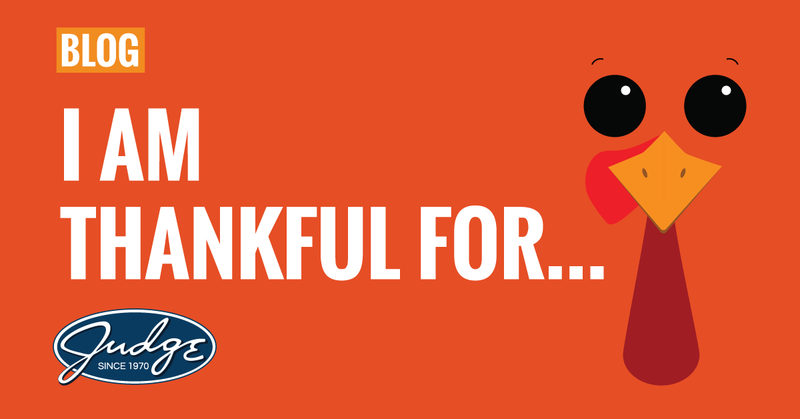 Let us know what you are thankful for (or your favorite part of Thanksgiving dinner) in the comments.